Craignaw - the Awful Hand & Murder Hole. 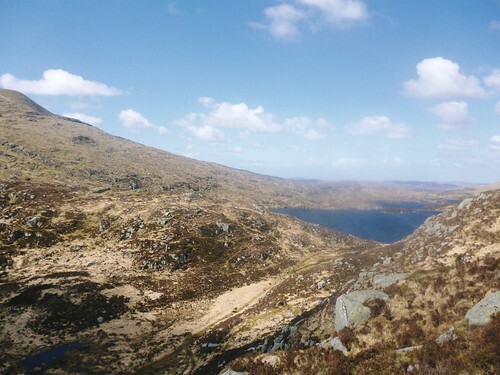 Scaled Craignaw yesterday, my penultimate Graham on the mainland, returned via Loch's Enoch & Valley and Buchan Hill. Last edited by Norman_Grieve on Wed May 16, 2012 5:40 pm, edited 1 time in total. Herebe the 1st o' the photies. This time I simply padlocked ma steel hoss tae their inner security gate & following some tooing & froing, pointing out various unidentified long parallel scratches, I was awa with the minimum o' fuss. After enjoying a wee 50th birthday party with wee Norm & Norma, scoffing doon a variety of posh farmfoods cakes, washed doon with wee Norm's orange lucozade and losing numerous games of musical statues, we were awa with the rush hour traffic. Next stop was Stirling services for a wee rest break, alongside a multitude of big trucks, thence speeding along the delightful new turnpike, bypassing Moodiesburn, with it's 30mph zone & traffic lights, for the very 1st time. Even the notorious bottleneck through central Glasgie had quietened doon and we were soon crossing the Clyde & on the right road tae Killie at first pass. Beyond Killie I glanced nervously between a succession of [low], Average Speed cameras, ma speedo & the near empty straight dual carraigeway stretching towards Ayr. Beyond Ayr things slowed doon further, as the windy twa lane blacktop straightened just lang enuf for ma tae pass a line o' trucks, before being almost stopped in ma tracks by the narrow streets of Maybole. The pudding shape of Ailsa Craig soon appeared ahead o'er the sea, as we approached the coast at Turnberry. A few miles south along the coast took us through Girvan, where Norma developed a severe case o' the munchies, as a chipper receded into the distance in the rear mirror. 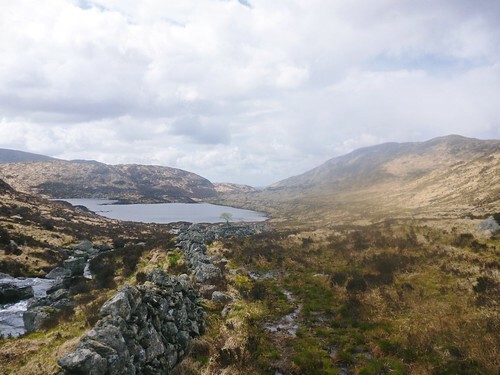 I assured her that there was bound tae be another along the A714, which followed an even windier course inland, parallel to the railway as far as the wee cottages of Barrhill, where there appeared only tae be a closed looking pub. Dusk was falling as we turned left towards Glentrool after another 10 miles, where we swung off the wee lane into a crowded wee car park opposite a smart wee hostelry just another mile up the road. Inside there was an impressive, if expensive menu accompanied by large letters announcing that food was served 'til 8.45pm, it now being 9.25pm. 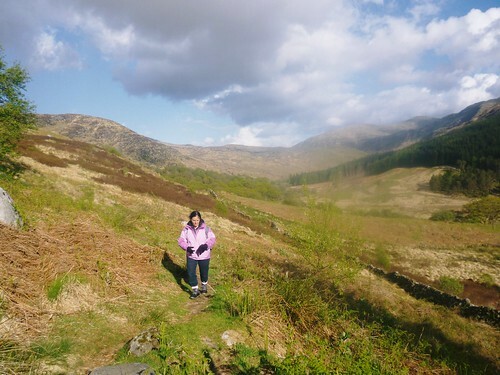 I teld her we were headed for White Laggan bothy, although Norma made clear her objections, not even the 3 star Resourie, at which we'd bid the nicht a fortnight earlier, being comfortable enough for her liking. 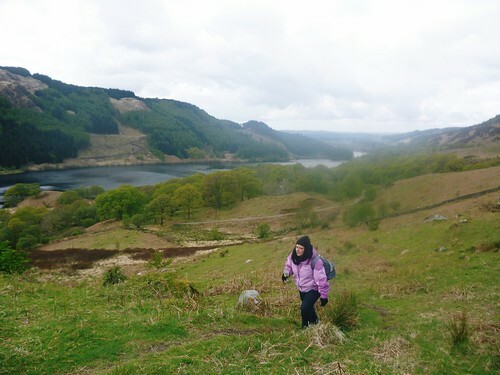 She was also put off by the hike in, which I had tae admit was rather longer than the 5 mins it had taken tae Resourie. 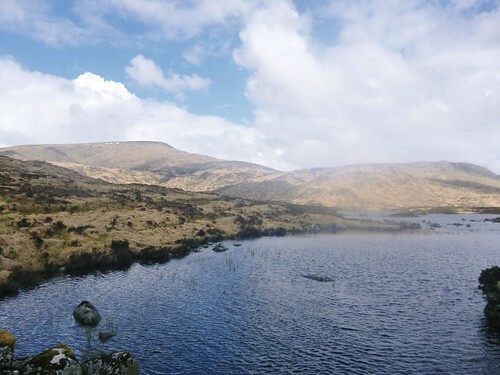 The landlady teld moi that we'd best drive round tae Clatteringshaws loch, the walk-in fae there being much shorter but I replied that I'd already driven for over 4hr fae Airberdin and would rather walk an extra mile or so, rather than drive another 30 miles o' twisty, narrow roads. 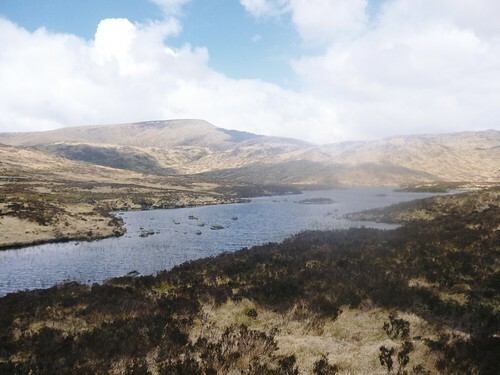 Thus, we were soon turning off right through the forest up towards Loch Trool, which after a few miles led to the large car park beyond Bruce's Stone. Mindful of the unexpected ease with which we'd driven close tae Resourie, I carried on doon the steep twisting track dropping down the hill beyond the carpark, thinking it couldnae do any harm tae see hoo far we could get towards White Laggan... Across the narrow Buchan Burn bridge I stopped in front of the imposing gates of Buchan Lodge, before turning up the track to it's left. 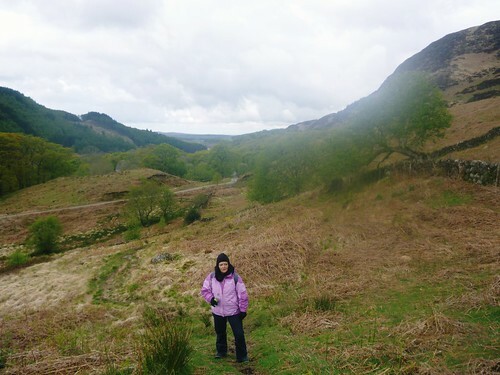 The track led up the hill, past a gate on the left, then over a wee bridge, only to arrive at a padlocked gate. Motorised approach experiment apparently over, I handed Norma my headtorch & asked if she would kindly shine it on doon the track behind us, so I could see to reverse, it noo being otherwise pitch dark behind. I then got out to see if there was enuf room to turn the car in front of the gate, deciding that the answer was negative. Back in the car I only succeeded in almost reversing into the ditch on the left, as Norma shone yon torch through the back window & into mein eyes, rather than illuminating the track as instructed. Shortly thereafter the headlights of a Landrover appeared through the gate and a woman got out & approached, asking what we were doing there? I replied that we were attempting without much success to reverse doon t' lane and suggested that things might be easier if she were to unlock the gate, so we could continue ahead. Perhaps not unreasonably, she pointed out that this would mean that she would have the same problem as us. Having extracted oor intended destination as White Laggan, she then dropped the bombshell that this had been 'gutted' and locked a week earlier! The woman then suggested that she should reverse our motor, as she had kent the track for decades, expressing exasperation when I declined, as she 'wouldnae be insured'. I then implored Norma wance more tae shine yon headtorch back doon the track, rather than into mein eyes and with Mrs Landrover shouting instructions, finally managed tae reverse back doon the hill. 'Hard right! ', screamed yon local woman, as I passed between yon deep, waterfilled ditches, o'er yon narrow bridge and beyond yon tree trunk. Trusting her judgement as to both the firmness & levelness of the unseen ground off the track, I spun the wheel and bumped round to a halt in the long grass. Then, finding with some relief that the rear wheels were nae too bogged doon, I brought her round back in a tight forward arc to the right, back on tae the track. Mrs local farmer's wifey then offered Norma a bed in her cosy farmhoose, when being teld that we were noo intending tae kip in the car, in view of the alleged state of yon still distant bothy. Somewhat surprisingly Norma declined, later explaining that this was due in part to the offer being apparently extended only tae her, nae us both... Back up the steep twisting hill, we soon pulled up alongside a newish Honda Civic and pulled oot oor auld thin sleeping bags, the neverending wait for mein cosy, long since paid for, Mt. Eqpmnt Starlight II bag being ongoing. After supplementing the fancy soup with a couple o' ham sarnies, I soon dozed off, the long drive catching up on moi, only to wake up very early, around dawn, noting that the skies were clear, hence the chill in the air. After a while I dozed off again and when I awoke once more the heat of the sun pouring through the windscreen, suggested that the hour was late. A glance at ma mob. 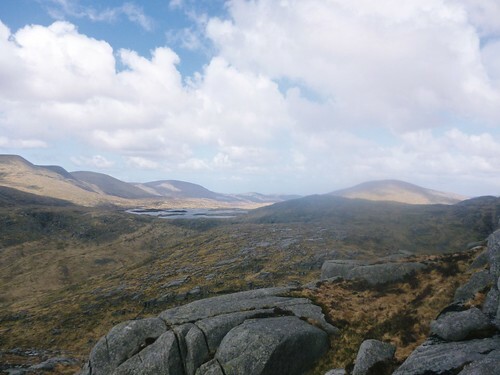 provided confirmation, it being after 9.30am and after another couple of sarnies I sprang into action, pulling back on my trusty S4k Verto North Face B2 boots, which I'd earlier fallen asleep in, having been intending to hike into the bothy. 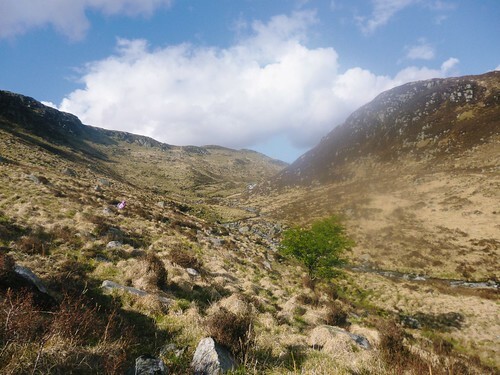 There was a mass of bluebells carpeting the slope running up fae the carpark and the rain showers which I'd heard drumming against the roof during the night, seemed to have long since passed over. Norma soon gathered together her fishing tackle and was ready for the off in record time for her, being measured in just minutes rather than the usual hours. 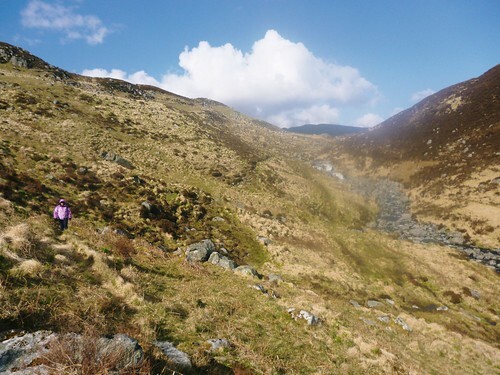 She then made short work of the 100ft descent along the track doon tae the Buchan Bridge, crossing the burn o' the same name which she'd followed with me after descending fae Merrick 9 years earlier, when carrying wee Norm, 3 months afore he emerged intae this world. Past a trampled down fence, where a wee path followed the true left bank o' the burn up past the waterfalls, we then ambled up the lane, soon reaching the scene of our motorised tribulations of the previous evening. Just beyond the padlocked gate which had proved the nemesis of our 4 wheeled adventures, we cut off on an attractive, grassy path, which led straight ahead where the track turned doon tae the right, towards Mrs Landrover's hoose. 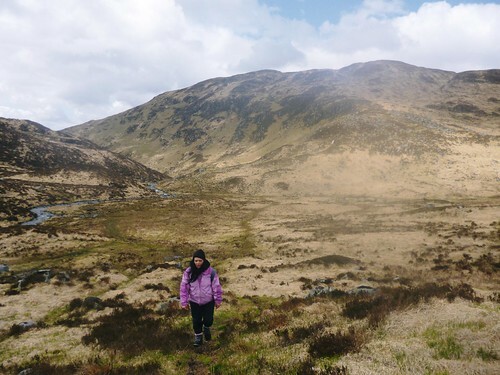 The path was signposted tae Loch Valley & the Gairland Burn and after a wee steeper section on a close-cropped carpet of very green grass, of which the Augusta National would no doubt hae bin proud, it levelled out before reaching a wee stream. Here Norma needed a wee hand, crossing the wobbly rocks, poised above a steep, rocky chute doon which the water cascaded. 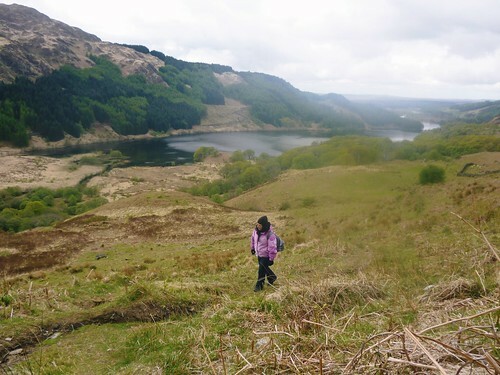 Looking back there were fine views down over Loch Trool, nestling in it's fine, wooded crag skirt hollow. Across the stream things steepened up once more, Norma slowing to a snail's pace, as I crossed through a wee gate in the top bounding wall. 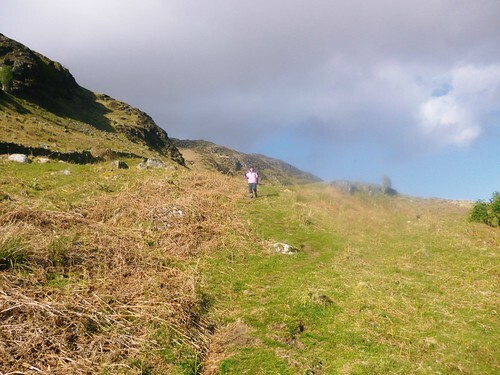 The path then turned right to follow close beside the wall, climbing steadily, becoming much rockier & muddier, running below wee crags up above. 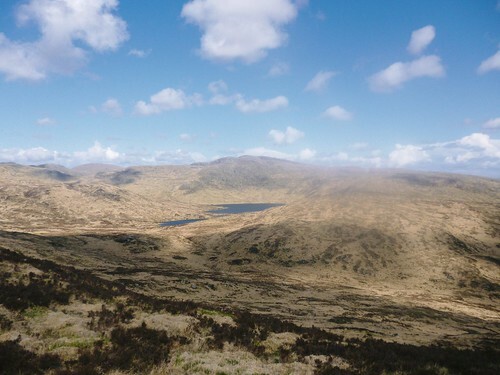 The flat topped Graham, Lamachan Hill and it's more shapely, craggy neighbour Curleywee, to it's left, were well seen fae here, just across the valley, behind the steep, craggy forepeak Mulldonoch. I cast my mind back to my increasingly rough, tussocky descent fae the col hidden behind it, Nick of the Lochans, in gathering gloom, in late September a couple of years ago. From the wee col above the steeper rocky section alongside the wall, there was a distant view down past Glentrool, towards some low hills towards Stranraer. Norma said she could make out some windmills on these with her sharp young eyes, although I struggled to make out more than one ephemeral, wavering image. 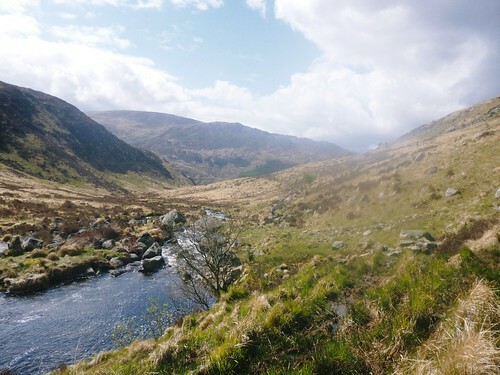 The grassier path levelled out then turned to the left, away fae the wall, to enter the valley of the tumbling, rushing Gairland Burn, at first keeping well above the large stream. It drew ever closer to the torrent, as two lengthy level sections were split by a shorter, both rockier & wetter descent. There was a brief light shower hereabouts, blown quickly awa in the fresh, cold breeze. The path got much boggier as the burn rose up close to the right, splitting into many watery, muddy branches, which weren't a problem for moi, in my fancy red Gortex lined boots but almost stopped Norma in her tracks, given her cheap suede 'booties'. 'How am I supposed to get past this? ', she wailed, as I snapped awa at the fine two-tiered cascade, beside which I urged her tae strike a pose. 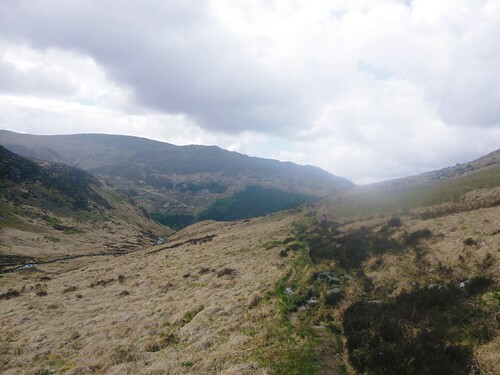 Here the valley narrowed and turned to the right between it's craggy sides, the path steepening up, as it climbed along the foot of Buchan Hill. 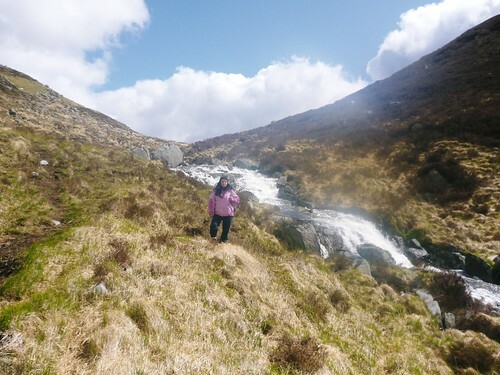 The path soon levelled out again, as it emerged from the confines of the valley headwall, becoming very soggy once more, across a wee stream, Norma spotting a wee dome tent pitched across the far bank of the Gairland Burn. 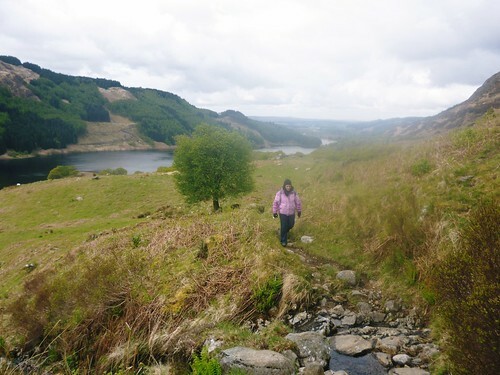 Here we took the central branch, heading across a flat, wet, tussocky stretch of boggy ground, straight towards where we could see the path climbing up a final knoll before the promised haven of Loch Valley. As Norma breasted the rise she said 'We'd better be able to see the blasted loch fae here', or words tae that effect, as I pointed to it's shore close doon tae oor right. This was as far as she was going, perhaps just as well, it having taken twa laborious hours for us tae get thus far, although I teld her that the path carried on to another, equally large lochan, Loch Neldricken, just half a mile further on, above which we could finally see my craggy objective, the elusive Craignaw. 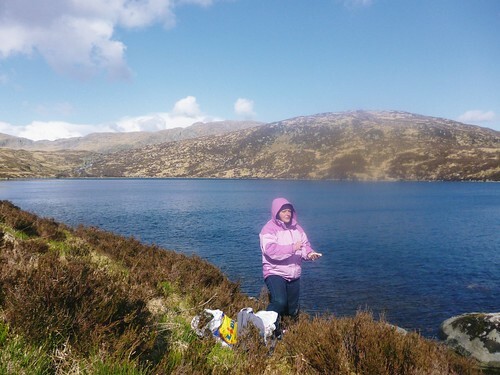 As I strode off, a touch relieved, as if let off the leash at last, I turned tae see Norma's light purple Sprayway jacket clad form, making her way slowly doon the steep, heathery bank to the shore of the loch, to begin her latest, long fruitless quest tae catch a fishie. 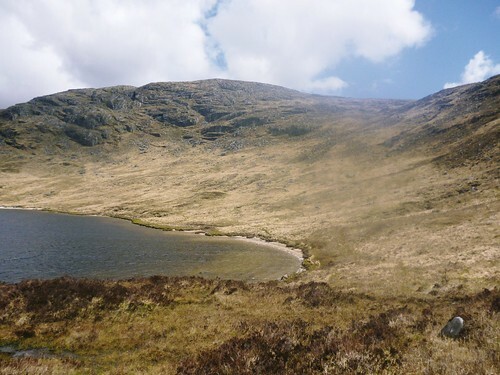 I soon passed the sandy head o' Loch Valley, where the main inflow, now named Mid Burn, entered the sizeable loch, nae far beyond it's outflow, the fair Gairland Burn of our approach. 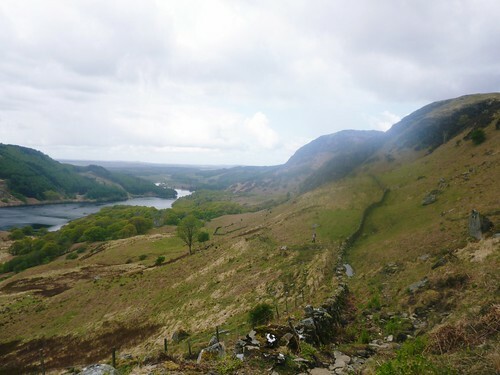 As the rather muddy, wet path started it's wee climb up to Loch Neldricken, it passed to the left of an old sheepfold, following the old wall which lay beyond, where I paused to snap the view back over the foot of Loch Valley. 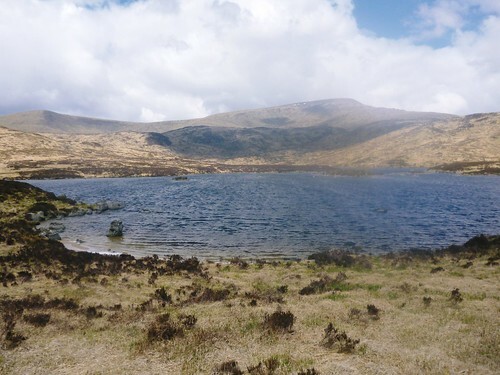 A few minutes later I reached the narrow foot of Loch Neldricken, where Merrick appeared up to the left, sporting a few wee snow patches. 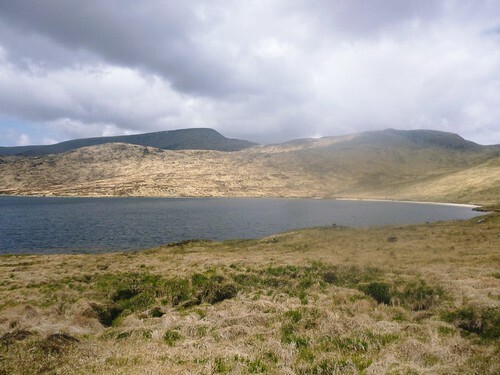 The Mid Burn was crossed easily on a few smallish boulders at the outflow of the loch, which here was dotted with more boulders and wee heather topped low islands, stretching along the SW arm of the loch, branching left towards the dark Murder Hole. Over the far bank I climbed up a few feet, then traversed left, descending slowly back towards the east shore. Beyond a wee sandy bay, I passed the narrows, past which the main part of the upper loch opened out, an attractive wider sandy beach fringing the far shore, backed by the tiered steep crags of Craignaw, now looming much closer. 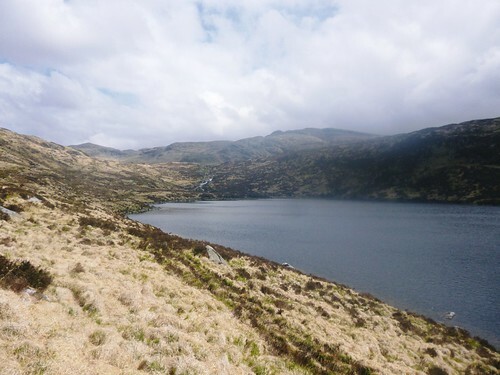 The narrow path was becoming grassier and less distinct, if less muddy and it split beyond a wee stream crossing, where I took the upper, right branch, then soon quit it altogether, climbing up rougher slopes of heather, interspersed with more tussocky grass. 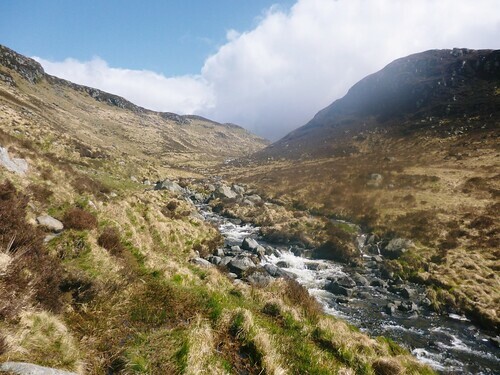 I turned back to the right after crossing the 2nd, larger wee stream, which ran doon over some glistening wet slabs higher up, shining bright in the late spring sunshine. 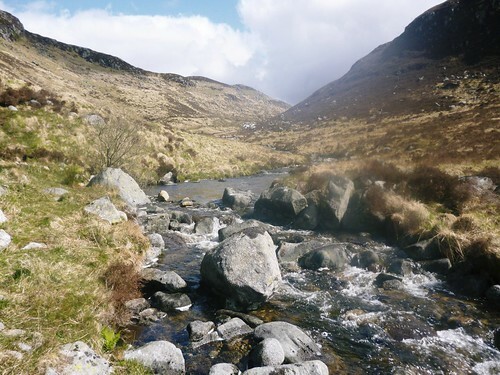 I was forced further right, close beside the slabs by a line of steep crags to the left but once I'd turned their right edge, the crest led up easily above a wee fork in the stream. 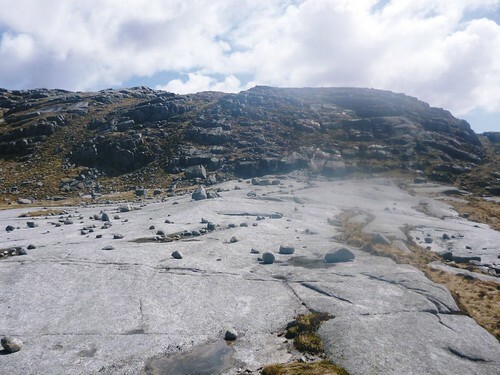 This was much easier than had appeared from below, with lengthy sections of easy, low angled scrambling on the gorgeous pale grey microgranite slabs. 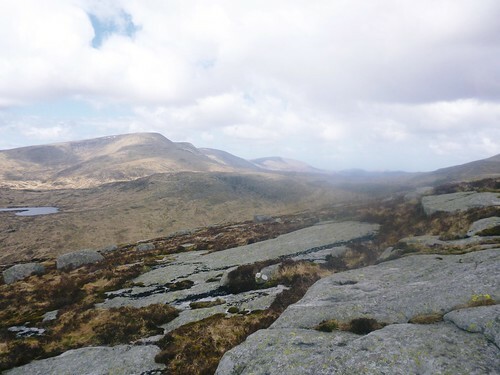 From here a fine view opened up over towards the neighbouring Grahams of the Millfore - Lamachan Hill ridge to the south, over the high sub2k Marilyn of Craiglee, and NW to the long higher ridge extending NW from the reigning Corbett of Merrick to distant Shalloch of Minnoch. 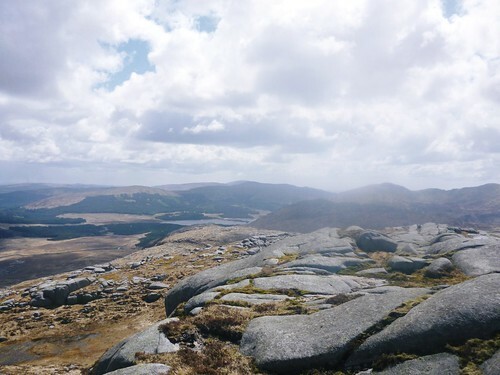 All too soon the angle levelled off and I followed the left edge above the Black Gairy cliffs, then moved right across the far end of a long, grassy hollow below steeper pale grey granite outcrops leading above towards the summit. 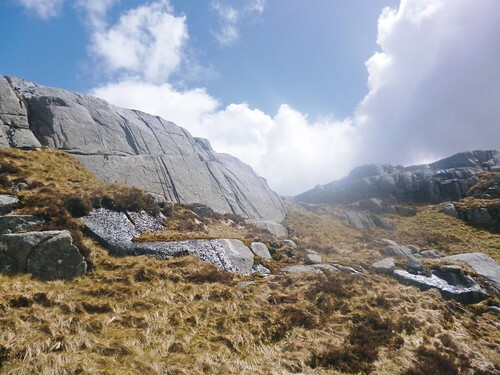 After threading my way through some of these I came across a particularly attractive, very steep smooth sweep of granite, seamed with parallel cracks. This I couldn't resist and attacked the central crack toute suite, not even stopping to take off my rather too large pack. After 15ft or so the fine holds seemed to peter out to much more tenuous, smaller knobs & rounded edges, rather less suited to my large, clumsy boots. Thus, as it looked like another 30ft or so to the top, I reluctantly decided discretion was the better part of valour and reversed the moves I'd made thus far, easily enough, as it turned out. 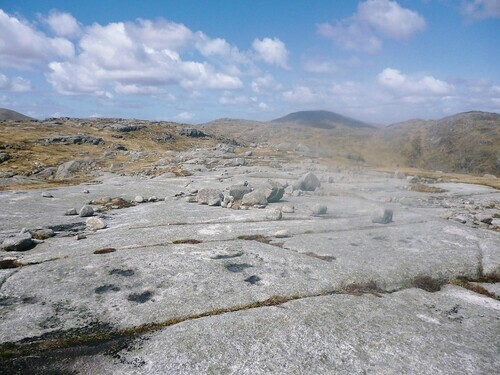 Fae here 'twas a mere few minutes over easy ground to reach the summit, which lay over to the right of several slightly lower tops & sported a fair sized cairn of small rounded granite boulders set on a low angled pale grey granite slab. It had taken 3 1/2hr fae the off, a time which I suspect not even Squiz would have to break sweat tae smash with ease. 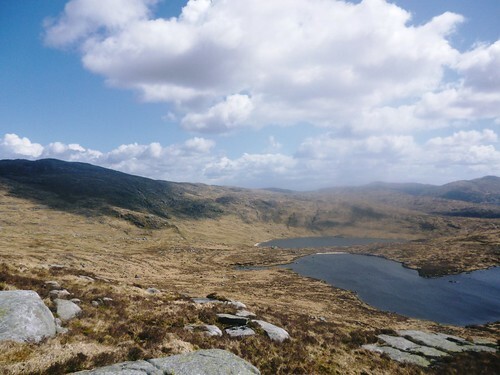 Fae here the views opened up to the north over to Loch Enoch, the Awful Hand & the steep cone of the neighbouring Graham, Mullwharchar, with beyond it to the right, distant Loch Doon, from which I'd made it's ascent a couple of years back. 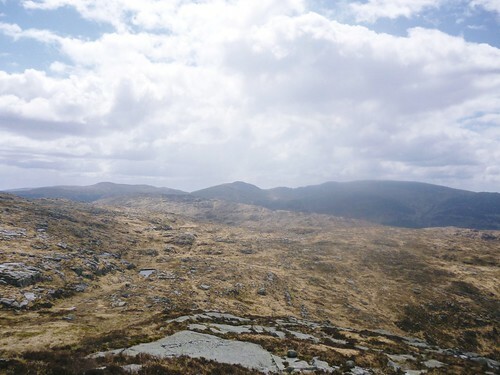 Much closer to the right, east of the Gala Lane burn, amongst whose monstrous tussocks I'd returned on that occasion, stood the long, high rounded ridge of the Corbett Corserine, climbed in gales, rain & snow with GC a few years earlier. 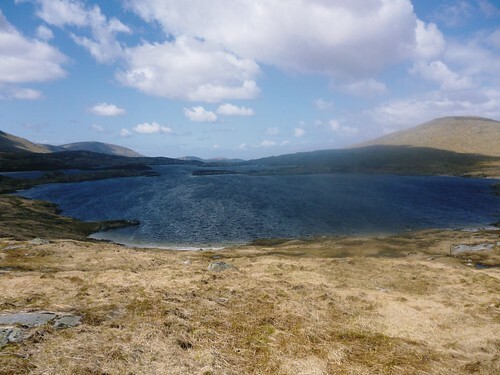 To the SE Loch Dee made an appearance, over the top of high sub2k Marilyn Craiglee, although it was too distant to make out the long lost White Laggan bothy. After dawdling on the top for 1/4hr or so, snapping photies & txting ma Safety Officers, noting that ma haunds were noo nearly numb in the cold wind, I decided tae get moving wance again. 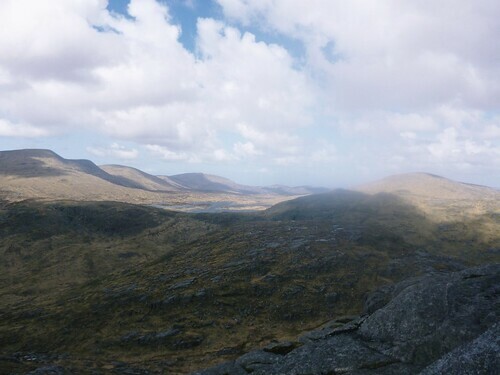 I wove ma way round the scattered wee outcrops, crossing a wee hollow to the NNE thence climbing up over the lower 638m top & doon the other side, making a beeline for steep, rocky Dungeon Hill. 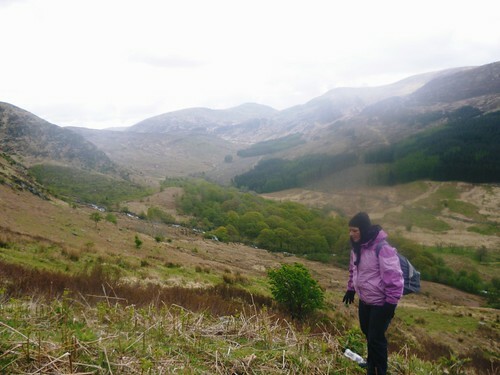 However, I soon realised that the narrow north ridge I was on descended steeply doon into the Nick o' the Dungeon & backtracked slightly, to investigate the north side of a gully cutting down to the left. 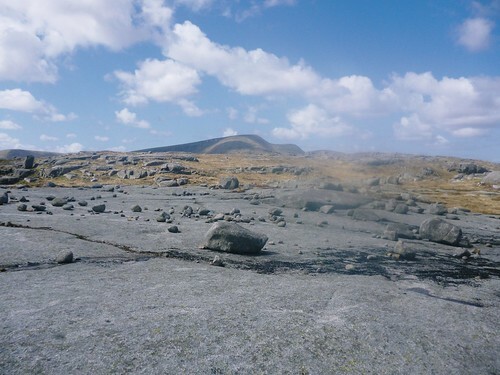 After a wee bit of easy scrambling on more of the fine pale microgranite, I dropped down into the grassy floor of the gully, which I then crossed to the left, rounding the foot of the summit cliffs. 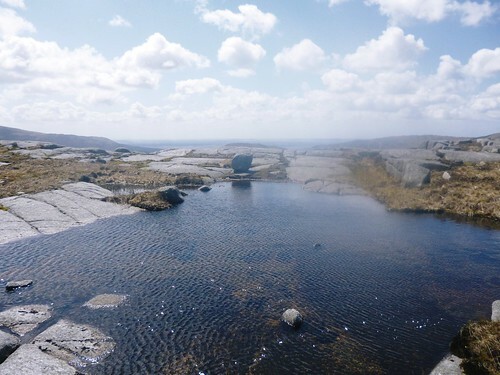 I then moved right below a wee col, close to a wee lochan, where there was a huge polished granite slab, littered with rounded granite boulders, making such an attractive foreground that I couldnae resist firing off several more exposures. Not far past here, as I made my way up gently rising but still fairly rough rocky ground over pt. 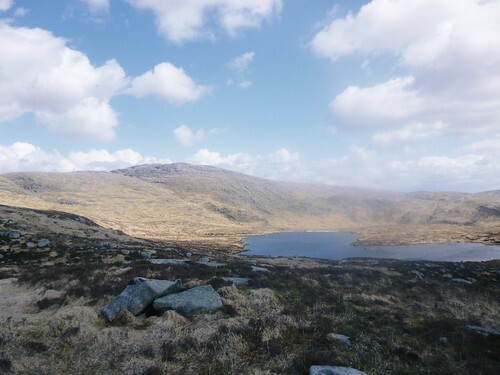 572m, along the NW spur leading fae Craignaw, I passed a fine wee lochan nestling between smaller granite slabs, with more glacial erratics scattered around. Descending more steeply towards the col with Craignairy, between Dungeon Hill & Loch Enoch, I was rather surprised to pick up a wee path, which eased the descent somewhat. 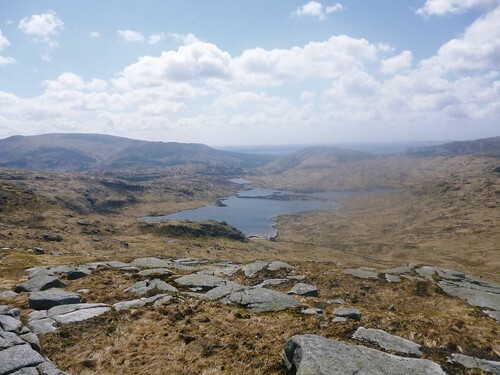 However, I veered off to the left, short of a cairn on the nearside of the col, to begin a further descent into 'the Wolf Slock', traversing close under the cliffs running around the head of this corrie, from which there was a fine view straight down to Loch Neldricken. I was aiming for a fence which ran up the far side of the corrie up to Loch Enoch, along which I fancied I could see a fair path ran but once reached this seemed little more than another sheep track. 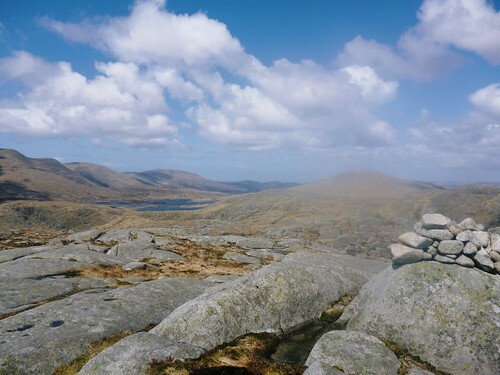 This soon took me easily up the headwall of the evocatively named corrie, emerging on a col, not far below which lay the SE bay of Loch Enoch, the windswept, choppy waters breaking on another white beach of fine granite sand. 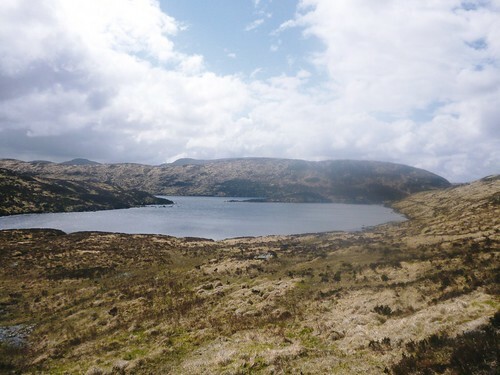 After following a wet wee path left, well back fae the shore towards Merrick, I again soon cut off to the left, making a gently rising asedcdeccent up the northern flanks of Craig Neldricken, the whole of the sizeable Loch Enoch, with it's trois main islands coming into view just below. 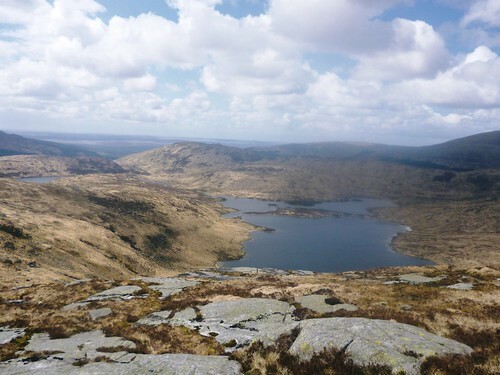 I soon crossed over it's west top,beyond which I turned further left, following the edge of a steep line of crags, towards wee Loch Arron to the south. 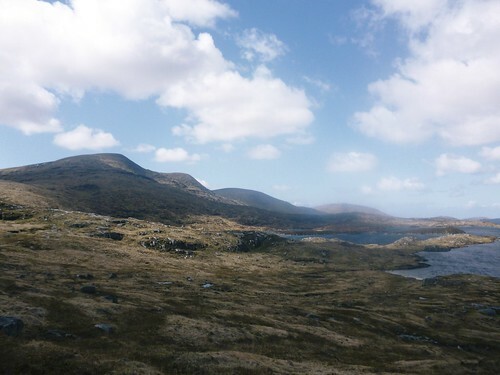 I then dropped down a break in the crags to the right, after having descended the rough, heathery edge for 100ft or so, following a low, rough ridge SW above the west end of Loch Arron. There was some very spongy ground, traversing up below pt. 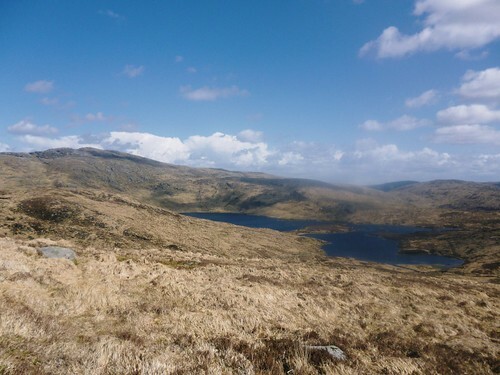 484m, where I was mindful of the advice received many years ago, possibly fae a taxi-driver, that someone had disappeared without trace into the bogs hereabouts. 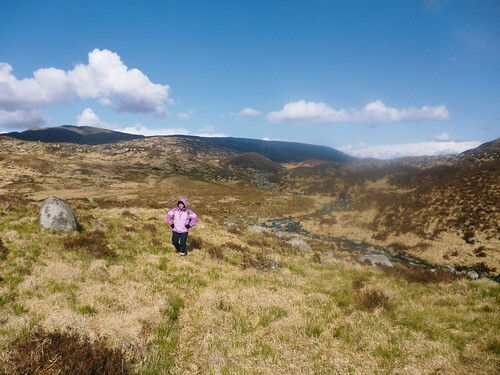 However, I managed tae negotiate what felt like a floating skin of rather tussocky grass, without ending up in some murky mire beneath, thence crossing over the low ridge, slanting further right close to pt. 487m. 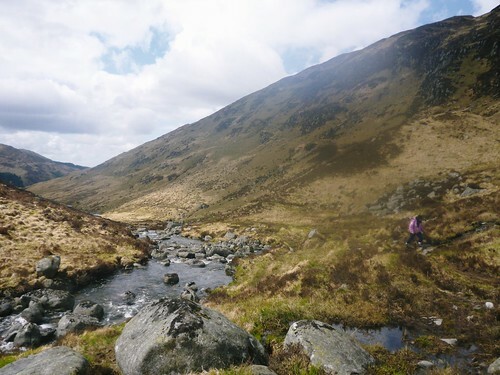 I then dropped down more tussocky grass, amongst scattered wee granite outcrops, gently sloping down to cross a stream above where it cut down to drain intae the Murder Hole. Fae here it was just a short climb up to the Rig of Loch Enoch, a long low ridge, over which I could see down towards the plantation, through which the Buchan Burn flowed down to close beside the carpark above Loch Trool, which I'd followed with Norma 3 months before wee Norman was born, on our descent fae the Merrick. 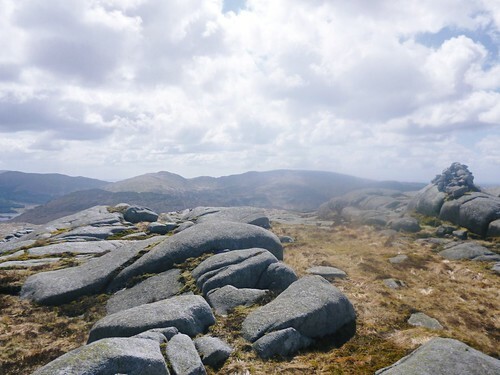 I'd got a vague recollection of reading a TR, mebbe wan o' Foggie's, which mentioned a good path along this long ridge, leading all the way tae the summit o' Buchan Hill and sure 'nuf soon hit on a nae bad wee path. Here I turned left along the ridge, along which I hadnae gone far before I dropped doon tae a wall, leading doon tae Murder Hole on the left. 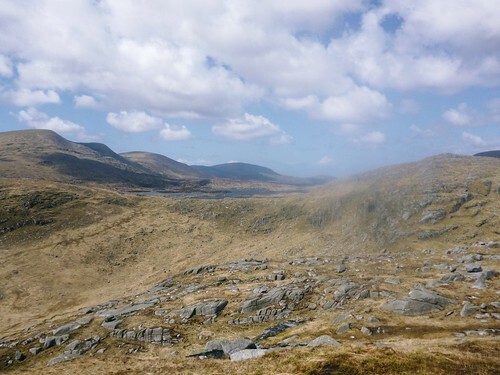 There followed a lengthy, near level section over Craignine, where Loch Valley came into view, with the intriguingly named low ridge of the Rig of the Jarkness, above it's right, south shore, leading over the Clints of the Buss, to the aforementioned high sub2k Marilyn, Craiglee. I reflected that surely this ridge was worthy of traversing, just on the basis of the wonderful names alone... In the meantime I began to wonder if Norma would still be fishing doon in the loch below, given that it was approaching 5hr since I'd left her. 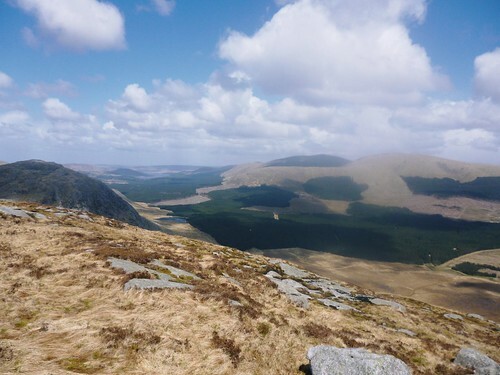 After a wee descent, then couple o' hunnerd feet o' climbing up the fairly narrow ridge I reached the summit of Buchan Hill. 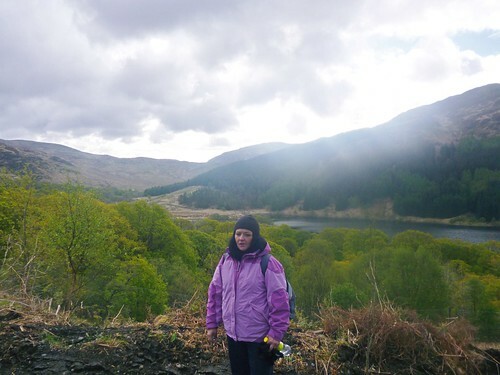 Here I spotted Norma's short bright light purple jacket clad figure awa below above the loch, so turned left to descend towards her. As I left the fair-sized cairn behind, she disappeared fae view, back doon towards the shore o' Loch Valley & evidently oot o' mob. network coverage, as I couldnae get thru' tae her phone. 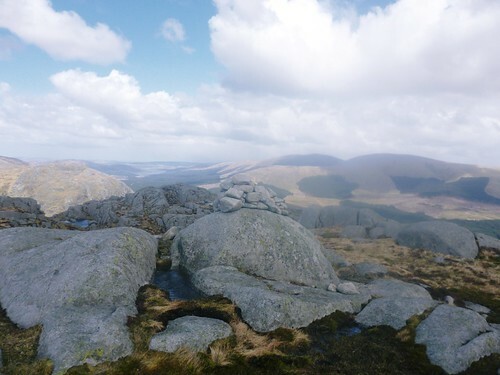 It was a simple stroll doon the moderate, grassy slopes of Buchan Hill's east flank, 'til not far above the path above the Gairland Burn, where I cut through some rocks, perched on the right side of the steep, craggy nose low down. 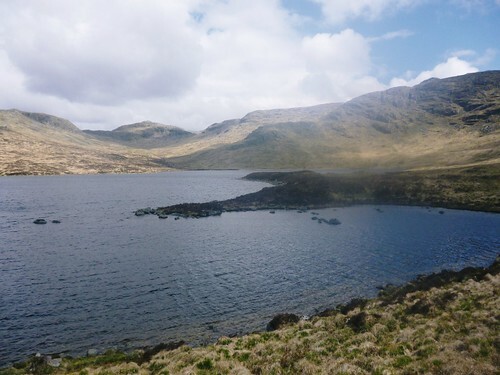 I then crossed the last wee stream below Loch Valley and followed the boggy final stretch to the foot o' the loch, where I found Norma, still fruitlessly fishing awa, after all that time, still without anything tae show for her efforts. Nae lang after 5pm I finally managed tae persuade her tae gie up, as the sun went behind a dark cloud and a cold rain started tae fall. I explained that I wanted tae try to get down to Newton Stewart afore the garage closed, where I hoped my climbing rope, which I'd left in my kaput motor, which they'd recovered 18 months earlier, was hopefully still lying. The shower soon passed over and the sun shone wance mair, as we made oor way back doon the valley, keeping well up the slope above the boggiest sections of the path which we'd followed up that morning. Progress was eased by almost continuous sheep tracks, as far as a wee hawthorn tree, about half way doon t' valley of the Gairland Burn, well below the main waterfalls. 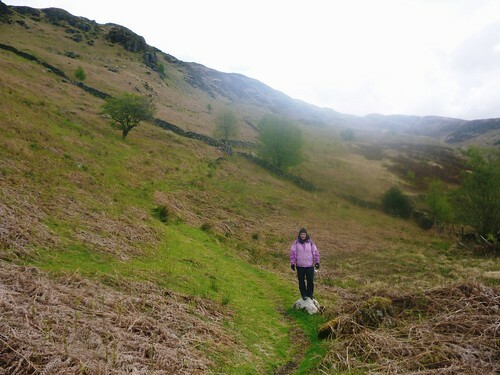 We then dropped down to the path for the long, straight, much better section, leading to the right turn out of the valley & back over the wee col. 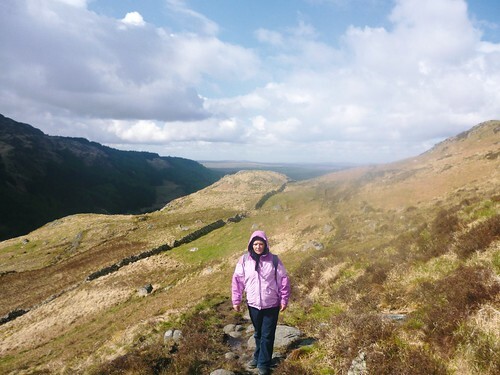 It was again possible to avoid the wet, muddy, stony section of the path, close above the wall, by hugging the lower edge of the crags on the steep hillside. Back through the gate in the wall and we were soon speeding doon the fine, firm short grass of the almost Lakeland path, traversing doon the hillside, Norma even managing the wee stream gully crossing unaided. Das ist alles mein volk! Re: Craignaw - the Awful Hand & Murder Hole. A good variety of light for your pictures there, Norman. Does the missus get to proof-read these reports before you submit them or are you just living dangerously?! Some interesting slabby rocks and crags along the way. 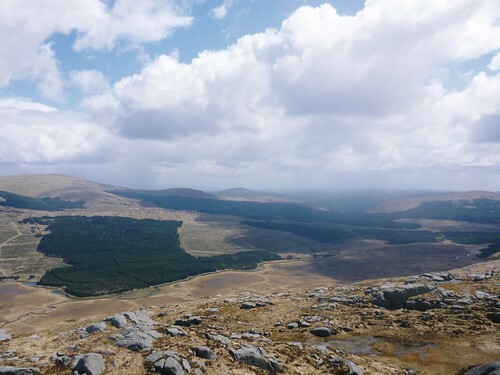 Have only done some biking and low-level walking around there so far but keen to get back and do some hills or even the rhinns. 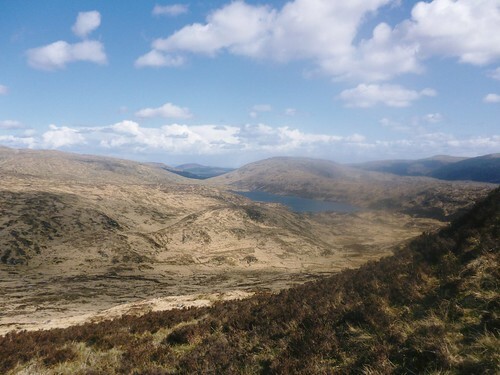 My old man wrote a pipe tune called "The Rhinns of Kells" many moons ago but I forget the back story to it and must remember to ask him about it again. What's the final mainland Graham then, one you've been saving until last or is it back to D&G? BoyVertiginous wrote: A good variety of light for your pictures there, Norman. kevsbald wrote: Fantastically drole. Love it. Ah mebbe hardy but o' so tardy. Now that ain't drole - noo ah'm on t' dole?